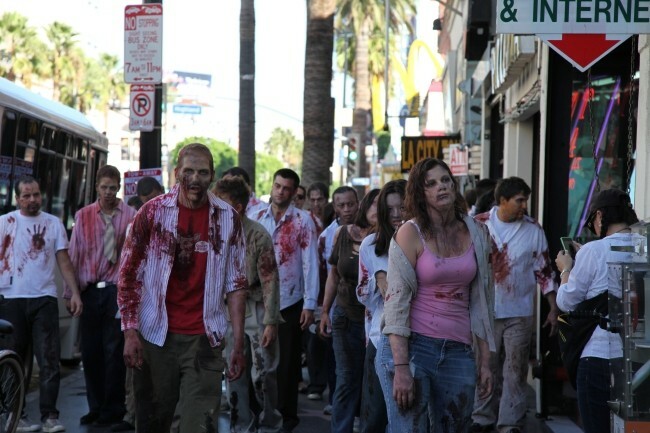 San Diego Comic Con fans won’t be the only ones to come face-to-face with walkers from The Walking Dead. Universal Studios theme parks are going all-out for the hit AMC show this Halloween. Fans with a voracious appetite for AMC’s The Walking Dead will have a chance to walk in the footsteps of human survivors when Universal Studios Hollywood and Universal Orlando Resort debut all new terrifying mazes inspired by Season 3 of the critically-acclaimed, award-winning television series at this year’s Halloween Horror Nights events beginning September 20. The eerily authentic and disturbingly real maze experiences will place Halloween Horror Nights guests at the heart of the show’s once impenetrable prison, the West Georgia Correctional Facility, now overrun by hordes of flesh-eating walkers. The mazes at Universal Studios Hollywood and Universal Orlando will send guests cowering through the walker-infested wilderness that surrounds the prison and into the seemingly utopian town of Woodbury where gruesome secrets are concealed. The Golden Globe-nominated, Emmy Award-winning series The Walking Dead is based on the graphic novel written by Robert Kirkman and published by Image Comics. The series tells the story of the months and years after a zombie apocalypse. It follows a group of survivors, led by sheriff Rick Grimes, who travel in search of a safe and secure home. The Walking Dead is the first original cable series ever to end the broadcast TV season as the number-one show for adults 18-49. AMC’s The Walking Dead returns for season 4 on Sunday, October 13 at 9pm ET.